A Companion to the Roman Empire provides readers with a guide both to Roman imperial history and to the field of Roman studies, taking account of the most recent discoveries. This Companion brings together original essays guiding readers through Roman imperial history and the field of Roman studies. Shows that Roman imperial history is a compelling and vibrant subject. 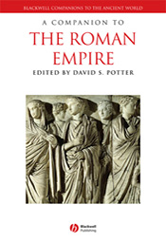 Includes significant new contributions to various areas of Roman imperial history. Covers the social, intellectual, economic and cultural history of the Roman Empire.